Our news and blog section gives you an insight into the latest goings on at AGCO Parts & Service, including not only the products and services that make your life easier, but the people that help to provide them. 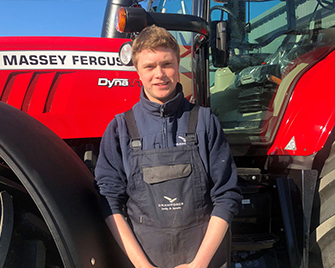 George Fenner, 17, has a long interest in the agriculture sector, with his father Arnie having worked on farms and taken a similar apprenticeship scheme in his younger days. Arnie was keen for George to follow this path, and George was equally enthusiastic about following this career route. On finishing studies at Chelmer Valley High School on the outskirts of Chelmsford, Essex, George took on a job at RW Crawford’s Essex depot, initially for just one day a week. Tom Voase, 17, followed a slightly convoluted route, before embarking on his AGCO apprenticeship journey. Having completed his GCSEs at Hornsea School and Language College in the East Riding of Yorkshire, Tom went on to complete the first year of a land-based tech course at Bishop Burton College. Luke Lovell, 17, is a former pupil at Thirsk School and Sixth Form College in Thirsk, North Yorkshire. Coming from an engineering background, with this father a transport manager and HGV driver and uncle a technician, Luke had an interest when leaving school. School-leavers in Yorkshire can play an important role in the future of food and farming, whilst earning, learning and developing a successful engineering career, through a dedicated apprenticeship scheme. Ahead of the 12th annual National Apprenticeship Week, between 4-8 March 2019, three young budding agricultural engineers explain why they have chosen to follow a path that promises to lead to a successful career for the rest of their working lives. IS YOUR MACHINE READY FOR WINTER? Are you and your tractor ready for the long cold nights? Our popular Lindt advent calendars are on sale NOW! Parts and Service World took place for the first time in Kassel, Germany on 13th and 14th October. Between now and the end of 2018, any customer booking a qualifying Out of Season Inspection with their dealer will be given a chance to enter into a prize draw to win a choice of two great prizes. AGCO dealer, Hamilton Brothers, have commemorated the 60th anniversary of Massey Ferguson in their own special way by giving customers a great deal on vintage tractor repair and restoration work. Living in the countryside of Copenhagen, Denmark, Annette works with a vast range of people and provides key skills and expertise. Shabber Sheikh's role in the AGCO Parts family epitomises what the whole team stands for: offering a better and more efficient aftersales service. Roberto uses his passion for machinery to drive his team to provide the best possible aftersales care throughout the market. Through this short video, we will show you how using a genuine AGCO clutch disk can benefit your machine. Richard's lifelong passion for farming and machines gives him a unique perspective and satisfaction from resolving a range of customer concerns. WHAT GOES INTO MAINTAINING A FENDT PROTOTYPE? In our latest People Behind the Parts video we meet prototype engineer, Josef Kreuzer. Your machine's turbocharger is essential in terms of performance, efficiency, fuel economy and emissions. AGCO Parts & Service are giving you the opportunity to feature pictures of your very own machines in our upcoming MF 10+ Parts promotional campaign. In our latest People Behind the Parts video we meet Reman Manager, Russ. In our latest People Behind the Parts video we meet Reman Product Manager, Rob. GETTING THINGS DONE, NO MATTER WHAT! Jari works for Valtra in Suolahti as a Service Marketing Manager. As a part time farmer, Freddie understands the need of the customer more than most. Massey Ferguson specialist Nick Rew tells us about the importance of keeping your older MF machine genuine. Olivier works in the heart of the Massey Ferguson family as an Engineering Director in Beauvais. Discover how carrying out proper cooling system maintenance to your Fendt using Genuine AGCO Parts can save you money. Nick Rew is Manager of Later Lifecycle and Heritage products for Fendt. Marko’s job is to comprehensively test all the parts used to maintain your machine. Nick Rew is responsible for the marketing and promotion of parts for older Valtra tractors. Meet the people who work hard every day to provide the very best aftersales experience possible for every AGCO customer.